Adrian has grown up around bikes, watching his father race and following in his footsteps competing in his first race at the age of 13. He raced all over Ireland and the UK and spent two years racing full time in France. He moved to the US in 2010 with his then girlfriend (now wife) and started working as a mechanic with the Colavita team. Since then he has worked with many of the top teams in the USA, supporting them as they raced across the US, as well as in South America, Australia and Europe. His knowledge of cycling both as a rider and a mechanic make him a huge asset to the team. He prides himself on building up a good relationship with the riders, knowing that trust in their mechanic and their equipment is essential to any rider. In March of 2018 Adrian’s son Cillian was born and he is looking forward to teaching Cillian to ride a bike as soon as he can. Back in 2000 winning a race back home in Ireland and my Dad there at finish line. What are you looking forward to working with such a strong team of diverse female athletes? Each rider is an individual, with their own strengths and their own challenges. I am looking forward to seeing these individuals come together as a team, and helping them achieve their goals. What are your ultimate goals/overall vision for the team and its athletes? To see each rider succeed to their best ability. What are the essentials to carry in your saddle bag? 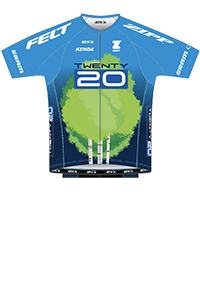 TWENTY20 has a strong focus on development and preparing girls for Olympic/world level racing. What sets this team apart in terms of development? Giving junior & young riders the chance to compete as part of a professional set up. If you weren't a team mechanic where would you see yourself? Your favorite things to do when not working with the team?